Are you tired of chilly floors in the winter? Is your crawl space too cold or too moist at certain times of the year? Is it costing you too much money to heat your home in the winter? Do you have a crawl space that’s damp, dirty and moldy? Installing the right kind of insulation can solve these problems. Here at Hi-Line Flood Solutions, we offer a variety of options for insulating your foundation. All of the insulation products we install are designed to withstand water and moisture and provide you with greater comfort from the ground up. Contact us today to request an inspection and Get a Quote! The best crawl space insulation. For extra comfort & energy savings, we recommend installing SilverGlo® rigid foam insulation against crawl space walls and TerraBlock™ flexible foam insulation on the crawl space floor, beneath the moisture barrier. 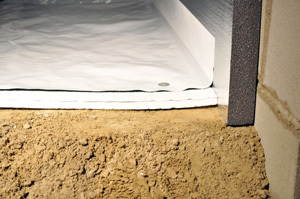 It’s smart to include insulation in the crawl space encapsulation process. While encapsulation seals the crawl space to prevent outside air and moisture from entering, it doesn’t stop major heat loss through the walls and floor of your crawl space. That’s a job for crawl space insulation. We don’t recommend insulating the crawl space with fiberglass batts. Batts will absorb moisture, compress, fall onto the crawl space floor and encourage mold growth. The best way to insulate your crawl space is to install SilverGlo® rigid foam insulation against crawl space walls and TerraBlock™ foam insulation over the floor. Both types of insulation offer high R-value, stability and durability. SilverGlo™ and TerraBlock™ won’t absorb moisture, support mold or deteriorate over time. Insist on these two high-performance products if you want to do it once and do it right. We can help you start from the ground up to improve your home. By creating a dry, comfortable space below your home, you can improve the condition of your living space above. We provide waterproofing and insulation services to customers in Havre, Shelby,Cut Bank and many areas of Montana. When you request a free quote for any of our insulation options, one of our experts will come out to examine your home and help you decide on the best solution for your needs and budget.